We reported a month ago that Samsung was testing the Android 7.0 Nougat update for the Galaxy A9 Pro. This handset was spotted on Wi-Fi Alliance’s online database running Nougat. Prior to that, the handset was spotted with Nougat on GFXBench and Geekbench. There was ample circumstantial evidence to support the possibility that Samsung might roll out the Galaxy A9 Pro Nougat update in the near future. It has done just that today. 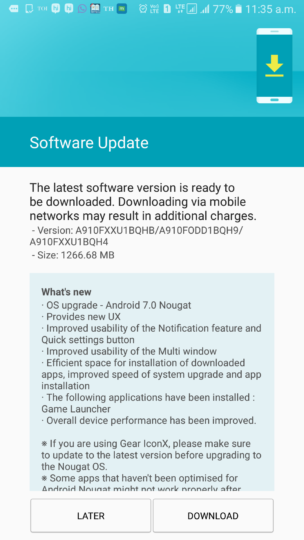 The Galaxy A9 Pro Nougat update has now been released in India. Samsung launched the Galaxy A9 Pro in May last year. It features a 6-inch Full HD display, Snapdragon 652 processor with 4GB of RAM and 32GB storage. It has a 16-megapixel rear and 8-megapixel front camera, fingerprint reader, Samsung Pay and a 5,000mAh battery. The handset was initially limited to the Chinese market before Samsung decided to release it in Malaysia and India a few months later. We had actually confirmed exclusively that this handset was going to receive the Android 7.0 Nougat update. Firmware version A910FXXU1BQHB is now being rolled out by Samsung for the Galaxy A9 Pro in India. Weighing in at just over 1.2GB, it brings all of the new features that are part and parcel of Nougat. It also brings a tweaked user interface that’s simpler and smoother than before. Galaxy A9 Pro users in India should keep an eye out for the update notification. It should arrive on their handset in the very near future. I am not able to get any FOTA update for Nougat in India. When I called Samsung Customer service they are cluless. You are most welcome Sammobile admin. when galaxy A8 2015 nougat update release i am waiting for the update samsung….. ? ?shame of you samsung. Can I flash my brazilian A9 SM-A910F/DS with the firmware A910FXXU1BQHB from India? 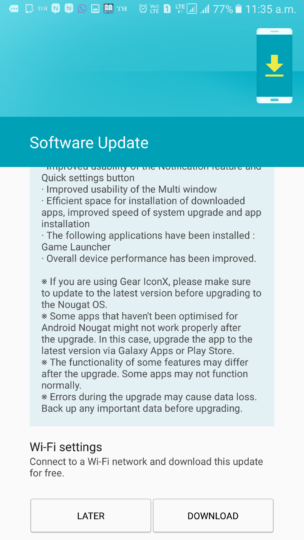 now when galaxy A8 2015 started to get nougat update samsung…..